Most of us long ago abandoned our childlike delight of playing with food; watching rapturously as it flowed through our fork, kneading it into a ball, belligerently breaking it up and squishing it through our fingers. Some lucky adults get to do this for a living. The International Dysphagia Standardisation Initiative (IDDSI) applies such tests to determine if food is safe for people with different stages of dysphagia – including the ‘Fork Drip Test’, ‘Fork Pressure Test’, and the ‘Chopstick Test.’ What fun. But it’s an important and serious matter for older people who suffer from stroke or other conditions that make swallowing difficult, and may choke or suffocate if food goes down the wrong way. IDDSI was only recently launched in Australia, with support from Speech Pathology Australia. Proportion Food representatives attended the inaugural IDDSI Australian User and Industry Forum 2018. Chief support officer for ProPortion Foods, Nikki, says she was impressed by “the willingness for collaboration between multiple parties – speech therapists, dietitians, food service staff, management and industry. Following instructions from Peter Lam and Dr Julie Cichero (IDDSI Co-Chairs), delegates and speech pathologists tested a range of foods, including ProPortion Foods’ SmartserveTM which was classified as Level 4 Puree. Smartserve products are “soft-textured dairy desserts and snacks high in protein.” They come in 10 different flavours and are easy to open. 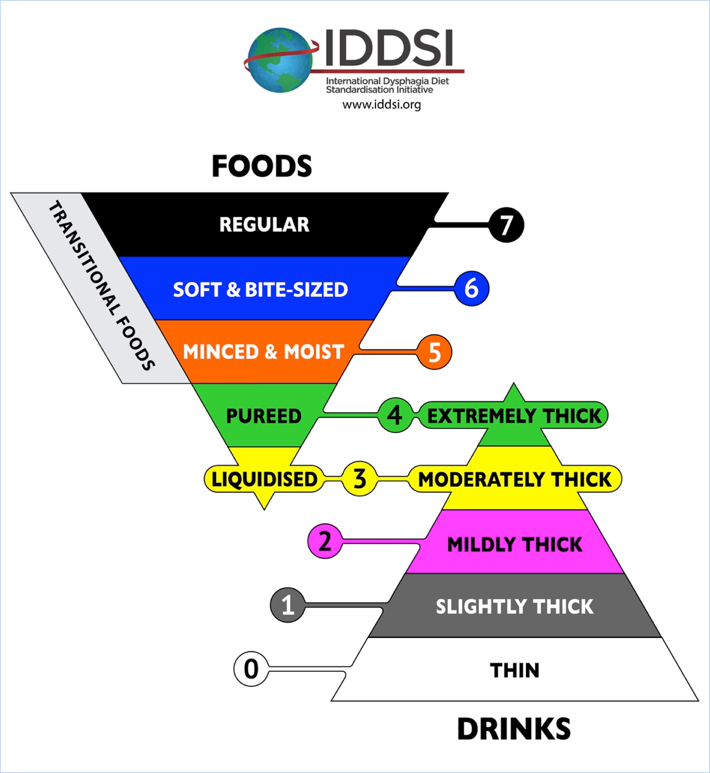 The IDDSI ‘Level 4 Puree’ classification – designated green – places the food in the ‘pureed’ food and ‘extremely thick’ liquid categories, comparable to the National Dysphagia Diet’s ‘Dysphagia Pureed’ category. As with level 3 (liquidised/moderately thick), the designation overlaps between food and drink categories. Considering feedback from food service professionals, IDDSI retained separate text labels depending on whether the item is required as a food or drink. Level 4 is measured using the fork drip test; the amount of food or liquid that flows through the fork’s prongs determines its level of thickness. Level 4 puree will remain on the fork, with some forming a “small tail” underneath. Australia’s implementation of IDDSI, replacing currently approved Australian standards, has three phases: awareness, preparation, adoption. Stage one, which started December 2016, was an awareness building venture amongst all relevant sectors. Stage two, now underway as of January 2018, involves preparing and approving processes, protocols, materials and products, and training clinicians, staff and relevant stakeholders. The recent forum marked an important step forward for Stage 2. The next step, on track for May 2019, will see the new IDDSI system introduced for commercial use, transition and integration.